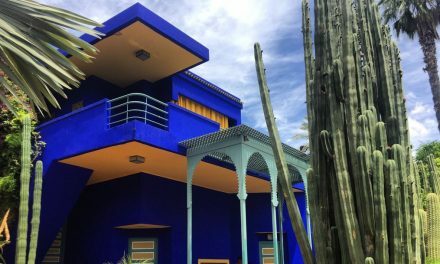 The Eat with Locals Food Tour was recommended by our Airbnb host, Zuzanna. We should say at the outset, we do not usually take tours, preferring to find out about a city ourselves but this is an absolute must do. We chose to do the Old Town Food Tour and we were lucky to have a cool but sunny winters day to wander through the city, visiting places that are both traditional and trendy but most definitely not the usual tourist haunts. We booked and paid for our tour online and received an email with instructions on where to meet our guide and helpfully a photo so we could recognise her. The tours have up to 8 people but as we were travelling in the off season, it was just the 2 of us. We met our guide, Míša at the appointed time and were delighted to find that she was an interesting, multi lingual, charming 30 something, who freelances as a tour guide and writer. We were quickly underway via hidden passages reminiscent of the Passages in Paris, Míša chatted away, providing us with information about the history and culture of the city as well as keeping us informed of the next destination. it’s history and the provenance of the food or wine. You can click on any of the following links to visit one or more of these fantastic Foodie destinations in Prague or use the map below to follow in our footsteps. Modern “chlebíček” are open sandwiches with egg mayonnaise or celery salad spread. Sister’s is one of the local office workers favourite spots for a quick, healthy, low cost lunch and it was quite busy. We vowed to make these at home and Míša assured us that the recipes are easy to find and easily made. 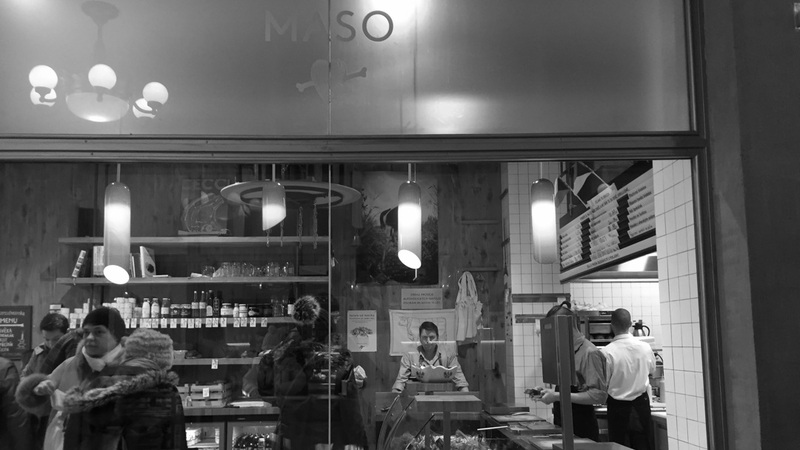 Located directly across the passage way from Sisters is Naše Maso, it is both a butcher shop and restaurant. We had the traditional “tatarák” or beef tartar and homemade meatloaf on Czech bread. We were both a bit taken aback by the steak tartar, but feeling adventurous we ploughed in and it was a delight of beef, chilli, onion and of course garlic. Naše Maso were apparently very much on the cutting edge of Czech cuisine when they insisted that Czech beef was good enough to eat and now own the farm. So glad they did it, this is a do not miss shop and quick lunch stop. For dinner the butcher shop is closed and you can eat right in the shop. It doesn’t get fresher than that! A bbq and grill restaurant in a specialist beer house, where the importance of finding the right dish to match your beer is serious business. 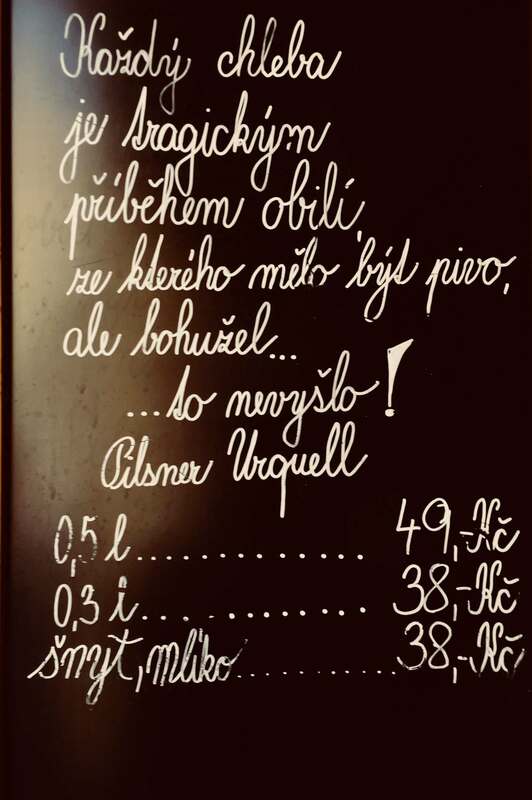 The Czech’s are pretty serious about food and beer, they even have little stories about how happy grain is to be made into Pilsner Urquell, as the sign at Katr points out. We were served “small beer dishes” such as “nakládaný hermelín” (pickled cheese) and “tlačenka” (aspic / headcheese), together with salmon with seasonal vegetable and potatoes/ grilled goat cheese on beetroot and Urquell Pilsner beer. It was here that we learnt about Mlíko and the Šnyt, Czech beer drinking traditions, be sure to ask about it at the bar. We could have and probably should have stopped eating after this meal, as we were both quite full, but no there was more just up the road! Slivovitz is a brandy, distilled from plums. we are assured the best brand is “Žufánek” and you can get it at Bartida Bar & Shop. “Slivovitz is for when you feel ill, when you feel well, when you feel sad or when you feel happy! We had previously tasted a supermarket version of this local spirit and it was like petrol. Clearly spending a bit is quite a good idea, as it was very nice and we were warmed and primed for the next destination. Located in the old Mint building, on the main square, Mincovna could be mistaken for yet another tourist restaurant as there are many to avoid around this part of the city. However Prague locals, have warmed to both the location and the excellent presentation of authentic, traditional dishes with a modern twist. “svíčková” – roasted beef with traditional sweet sour creamy sauce and Carlsbad bun dumpling, washed down with dark ‘ladies’ beer Velkopopovický Kozel. apple strudel, served with Becherovka, a Czech digestif liquor, made of a secret combination of herbs and spices. Becherovka has a secret recipe, only 2 people in the family who make the digestif spirit are able to know the recipe and like the royal family they can not fly together! The liquor broke through the sweet traditional apple strudel and whipped cream beautifully and we were left with a warm fuzzy feeling for our stroll; lets be honest it was a waddle, to the next destination. You would never find this cafe on your own and in fact we probably couldn’t find it again, without the map below. We were presented with more dessert, a unique Czech “Hořické trubičky” (Hořice rolls) filled with fresh whipped cream dipped in a hot chocolate. It was not needed by our waist lines but very quickly devoured, food babies were forming on our fronts. 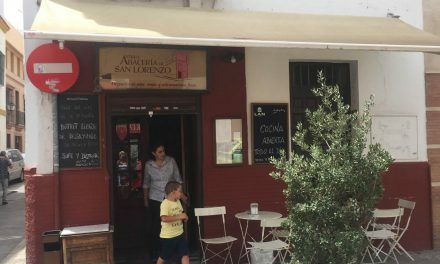 A funky little venue located in a small street not far from the river with a selection of Czech & Moravian wines. We tasted white, rose and red wine. The white and rose were ok, maybe a little sweet for our taste but the red, Kolos, was super. We spent a good hour or so chatting with Míša and having a second glass of the superb red wine before we purchased a bottle to take home. A future visit to Moravia may very well be on the cards as Míša let us in on her favourite weekend away, the cellar hop in the district of the Milan Nestarec winery. We would recommend making this little wine bar regular stop on your stay in Prague if you fancy a good glass of vino. This is not a budget travel activity but we would highly recommend the “Eat like a Local” tours and if you have the chance, request Míša as your guide. We felt like friends by the end of the day and she kindly escorted us back to the river, which as it turned out was only a couple of blocks, but we would have been seriously lost in the winding cobbled passages of the Old City without her. You are going to need to some exercise to walk off all those calories, why not try the PERFECT ONE DAY WALKING TOUR. If you or someone you know find this information interesting or helpful please like and share with the social media buttons below. If you would like to know more or give us some feedback on this or any of our posts please contact us or leave a comment below. This sounds exactly like the kind of tour that I would love to do. I spent a couple of days in Prague and was mostly underwhelmed by the food. I went to MINCOVNA, but not the one at the MInt. The tasting menu that you had looks fabulous. I wish that I had gone there instead. Wow, that’s very detailed and useful! I love Prague, it is by far my favourite European capital, not far from my lovely home city in Poland, -Wrocław. But I’ve always cared more about the monuments and historic landmarks (as Prague is so full of them!) than food itself. But we do appreciate good local food, too! Will try those places next time! We recently visited Prague and fell in love with the city! And, the food is so good. 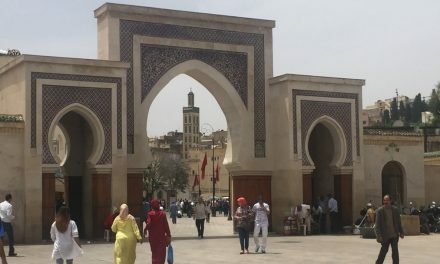 It sounds like a great tour and when we return to this city, we will be sure to check out the tour because we definitely missed these spots. Hi Jenn, thanks for reading and commenting. Enjoy your next trip to gorgeous Prague. 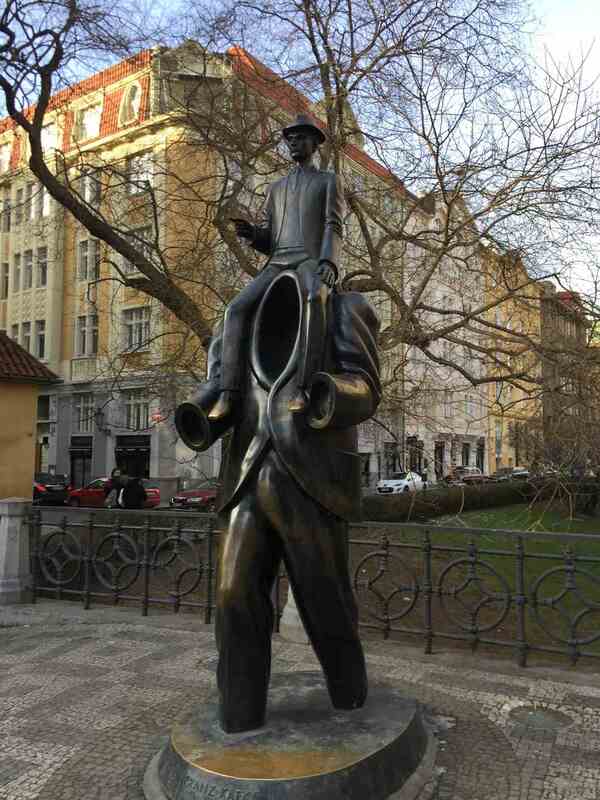 I did many walking tours in Prague, exploring all on foot. Though I tasted local delicacies but I did not do food tour . It sounds interesting. Who doesn’t love food tours? I have never been to Prague but the food they have seems delicious. I enjoy getting to know a culture through its food and a food tour led by a local guide is in my minds the best way to do that. Oh thank you. I was actually looking for places to eat in Prage. I go there quite soon. The official guide seem to suggest some tourist traps, but yours is much better. Bookmarked for my 2018 trip! These recommendations are going to help with the planning for sure! Hi Chad, thank you for commenting. We hope you love Prague as much as we did, we look forward to reading about your trip. Did you get a chance to check out the other posts on this great city too? Hi Constance, thanks for commenting. We would try a food tour again in a different city, like you it would need to be recommended to us. 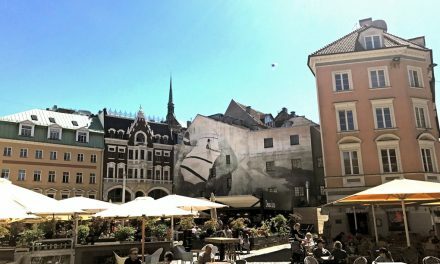 Its a shame that I have not been to Prague yet, I want to visit it for the architecture but this post now inspires me to explore the food side too, thank you for the tips and I am bookmarking it for my next visit. Thank you for sharing recommendations! Much better than ending up spending for a restaurant or cafe you are not sure about. Hi Charity, thank you for your comments, it was a great way to learn about the city, it’s people and find a few places that were great. Catherine you’ve just made me miss Prague, I used to live in a town called Pardubice an hour outside of Prague on the train and I’ve been to a few of the places you’ve mentioned, Loved the old town quarter . The best is walking around during the winter months, taking in all the smells, sitting at the cafes by the river. Prague is such an amazing city and there is nothing better than enjoying some wicked food in a perfect city. Great list! Really like all your descriptions and recommendations! Hi Renata, thank you for your comments. We fell in love with Prague and it’s food and wine scene, oh and the beer too. We have to admit to cheating with the spelling, we got a copy from the Tour company. Sounds like a good listing of hidden, cool places to eat. I’ll have to check them out when visiting Prague. Great post. That looks like a great tour. Thank you for sharing. Hi Nikos, thank you for commenting on our post. It was a great tour. We hope you can enjoy it one day too. I’ve never been to Prague but it is my list. Thank you for sharing the tour, I always love to try the local cuisine and meet new interesting people. I hope to visit Prague one day. I love the idea of a food tour, perfect for a food blogger like me. Perhaps I should use this as an excuse to visit 😊. This has made me want to go to Prague! If I ever get there one day I will definitely reference this blog post!